Find Fire and You Could Win! Can you find SSD Fire? 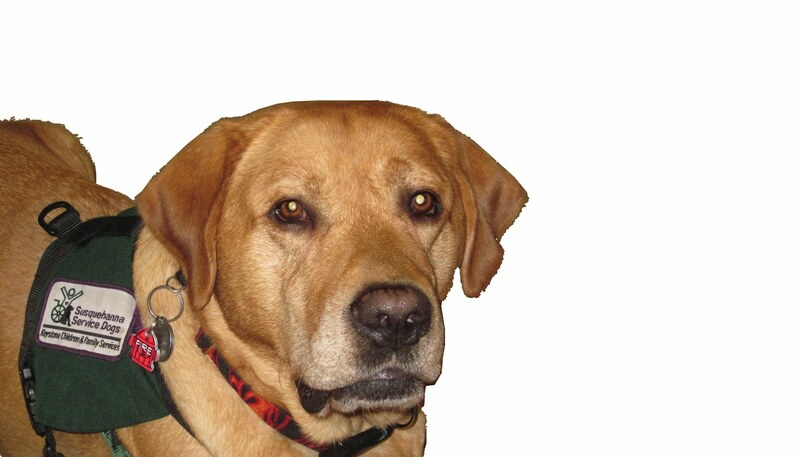 We've hidden SSD Fire's image somewhere on our PawsAbilities website. If you find him, you could win a free spin at Paw Draw at PawsAbilities on March 10-11! With your free spin, you could win prizes such as dog toys, treats, gift certificates, dog beds, leashes and more! Find the hidden image of SSD Fire on www.pawsabilities.net. Complete and submit the online form to tell us where you found him. You must use this form to be eligible. If you correctly identify Fire's location, you'll be entered into a drawing. Every Thursday at 2 p.m., we will randomly select two people to win a free spin at Paw Draw! Winners can pick up their free spin tokens at the Information Booth at PawsAbilities. Don't forget to buy your PawsAbilities tickets! 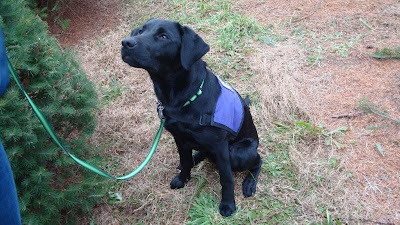 Visit www.pawsabilities.net and start looking for Fire! 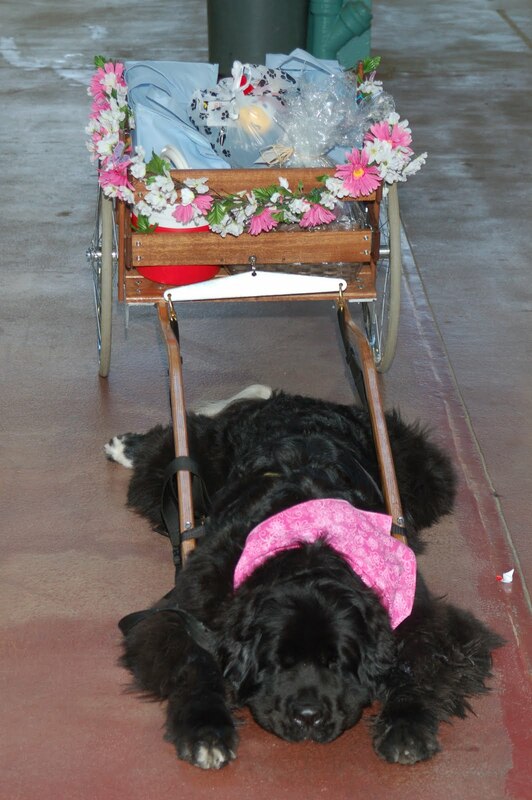 PawsAbilities is less than two months away and we're busy planning all sorts of fun things for you and your dog to do! One of those things is Paw Draw. Paw Draw is a raffle where you can win prizes, such as a new dog bed, tennis balls, gift certificates, dog toys, treats and more! We want to make Paw Draw as fun as possible, which means we need lots of great prizes. We're looking large and small items for either people or dogs. If you would like to donate an item or two, please let us know! This could also be a great opportunity for a project for girl scouts, boy scouts or other community groups. Thank you for your support and for helping us make PawsAbilities great! PawsAbilities is on March 10-11 at the Pennsylvania Farm Show Complex in Harrisburg, PA. Tickets are now on sale: www.pawsabilities.net. The Pennsylvania Farm Show. These four words bring to mind images of milkshakes, fried cheese cubes and a giant butter sculpture. These four words also strike terror in the hearts of puppy raisers. The Pennsylvania Farm Show is an extremely challenging place for service dogs in training of any age. Between the crowds, dropped food and animals, there are so many opportunities for dogs to lose their minds and completely forget all of their training. 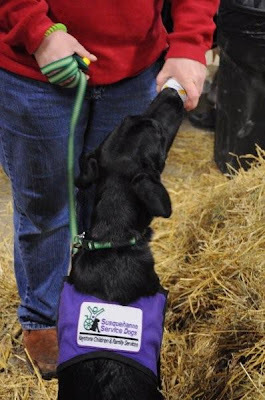 Donna, SSD Hale's puppy raiser, knew that the Farm Show was a challenging experience, but instead of concentrating on all the ways Hale could fail, she saw opportunities for success. 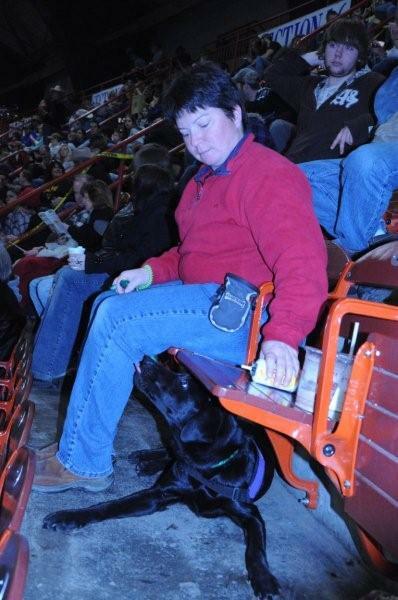 She came up with a training plan to ensure that she and Hale had a good experience at the Farm Show. She knew from last year, when she took Nubble, that the Farm Show can be overwhelming. Donna recognized that her own stress level affects the dog at the end of the leash, and she was determined to stay calm and keep her own stress level from affecting Hale. Hale loves people, so Donna wasn't worried about the crowds. She decided that if she saw any signs of stress, she would retreat and give Hale a chance to relax. During that time, Donna planned to reevaluate whether they should call it a day or continue their outing. 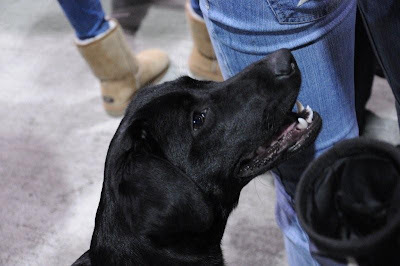 Hale went into the Farm Show with her usual gusto! The first thing they did was visit the cows, and the floor was full of all sorts of things a dog finds interesting. Hale may not have even noticed the cows because she was so interested in the things on the floor! To help Hale refocus, Donna moved back into a quiet corner where Hale could sniff the air without actually eating anything. After that, they stuck to the perimeter of the bovine hall, and then headed for the goat hall. Hale didn't even blink at being around the goats. 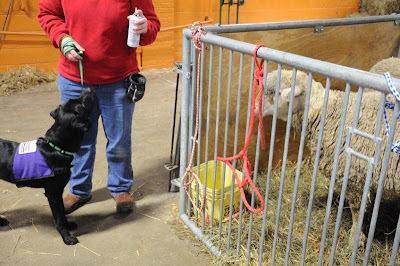 Her puppy raisers have goats, so she just wanted to greet them. Donna made sure Hale kept her distance, though. While Hale was perfectly fine with the goats, the goats were not as happy to be around a dog. Donna didn't want to add to their stress. The sheep, on the other hand, didn't seem bothered by Hale, although Hale wasn't as comfortable around them. Donna used lots of treats, especially power treats like cheese whiz. At one point, Hale barked, so Donna moved her away. 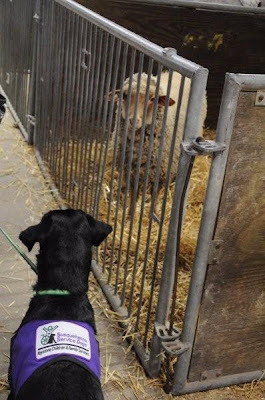 Once she settled, they approached the sheep again, and Hale did a little better. Donna decided to leave the sheep while Hale was still having a positive experience. In the rabbit area, Hale sat down right next to a row of bunnies in their cages. She just rested and drank some water. Donna also took her to the chicken area, but they kept their distance because the birds could get agitated by a dog. Although Hale did very well around the animals, she did manage to get into a bit of mischief. 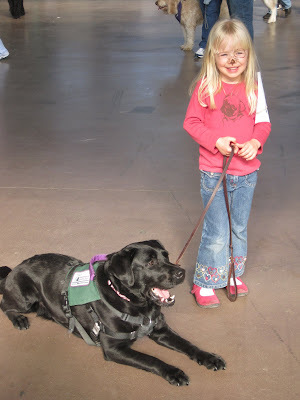 The children at the Farm Show loved Hale, and of course, she loved them! She even managed to give out a few kisses. However, considering the number of children who came up to her, she did very well. She even did well when one toddler tried to tickle her with a peacock feather! 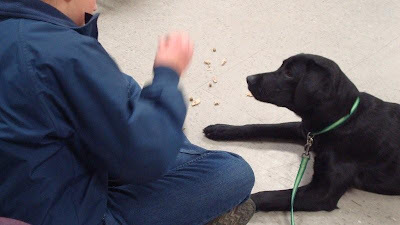 Many of the children asked if they could give her a treat, and Donna used it as a teaching experience as she explained that Hale is a service dog in training and only her handler can give her treats. Of course, you can't go to the Farm Show without getting some fried cheese cubes and a milkshake! Hale was very patient while waiting in the long line, although she didn't tuck herself up close to Donna. She always seemed to lay down so that she was in the way. People just stepped over her, though, and Hale didn't seem to mind. She did manage to scarf down a cheese cube that ended up on the floor. She was so quick about it that Donna barely got out the first syllable of "leave it." Since Hale was doing relatively well, Donna and Lindsey headed to the rodeo for a while. Even though they both wanted to see the rodeo, they decided they would leave if Hale was showing signs of stress. They had to go up a very narrow, steep staircase to get to some empty seats, and when they got to the top, Hale shook herself, which Donna recognized as a sign of stress. However, Hale relaxed and settled easily under the seats. There were two empty seats next to Donna, so Hale had some extra room to stretch out. She even relaxed so much that she rested her head on her paws. Once they settled into their seats, three teenagers, an 8-year-old boy and a 3-year-old boy sat in the seats in front of them. Their heads were at the perfect level for Hale to try to sneak in some doggy kisses, and she managed to lick the 8-year-old's ear. Luckily, he just laughed, said "hi" to Hale, and went back to watching the rodeo. Hale also tried to sniff the teenage girl's prayer cap. The 3-year-old occasionally watched Hale and reached back and scratched her back, but Hale was wonderful with him. Every time he interacted with her, she looked to Donna, even when he tugged gently on her tail. "I was quite proud of her then," said Donna. "She has definitely figured out that little kids are not her toys to play with." 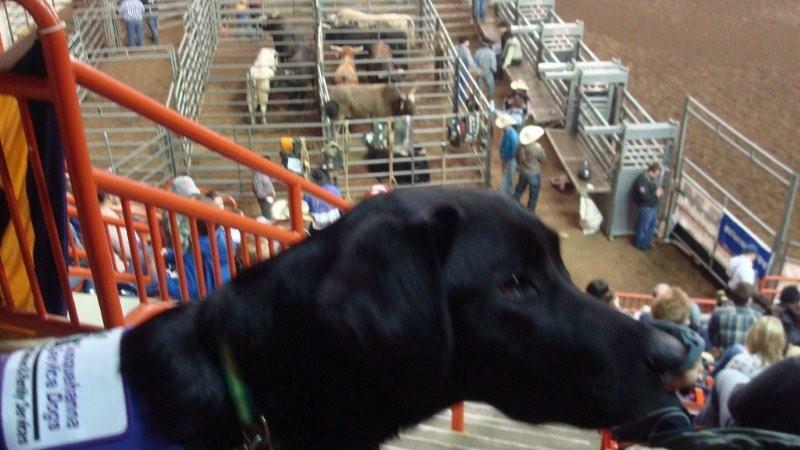 Although Donna was watching carefully, the only time she saw any signs of stress that concerned her was during the rodeo. At the very beginning, all of the lights went out and the crowd got very quiet, then very loud. Hale seemed a little worried, licking her lips and yawning. She did the same thing halfway through the rodeo when the lights went down again and the music got very loud. But other than the lip-licking and yawning, she was fine. 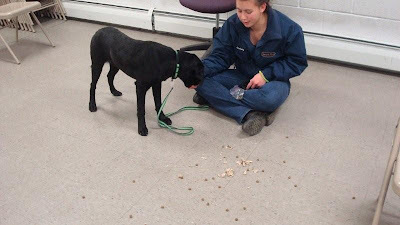 As they were leaving, Hale tried one more time to scarf down some treats on the floor, but this time, she grabbed a bead! Donna had to reach in her mouth to get it. Hale knows the cue "leave it," but she doesn't follow it 100% of the time. Donna plans to work on it with her. 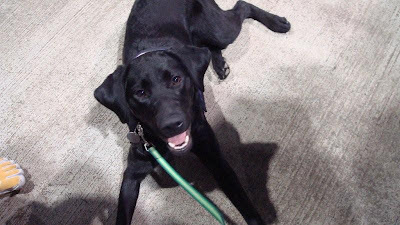 All in all, Hale did very well at the Farm Show, especially for an 8-month-old puppy. "I am so glad I took her," said Donna. "It was a great experience for her, and I think I had a good training plan in place so that I was able to enjoy our outing as much as possible." For Donna at least, the words "Pennsylvania Farm Show" aren't quite as scary. It's a dog's favorite time of year - PawsAbilities time! PawsAbilities is coming up on March 10-11 at the Farm Show Complex in Harrisburg, PA. We're working on an all-star line up of fun things for you and your dog to do. Tickets are on sale now! Tickets cost $8 for general admission, $4 for children ages 4-12. Dogs are free! You can buy your tickets at www.pawsabilities.net. SSD Hale is growing in leaps and bounds! Well, maybe she's just leaping and bounding. It's hard to tell if she's getting bigger. 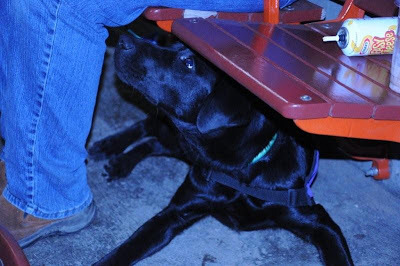 Donna, Hale's puppy raiser, has even had people ask her if Hale is a miniature Lab! They're always surprised to find out that she's only about seven months old, which is quite a compliment. It means Hale is very well behaved in public! This month, this little dog had her first real bath. She had been hosed off in the summer and wiped down with a damp cloth lots of times, but this time, she got a full bath in a grooming tub. Hale's first real bath is the perfect example of how we train our dogs to do almost everything. The grooming tub had a ramp, and Donna used shaping to get Hale to walk up the ramp. The hose was louder and had more water pressure than the garden hose, so Donna used treats to reward Hale for good behavior. At the end, Hale was very interested in the dryer, and she didn't mind having the air on her fur at all. Hale emerged happy and smelling great, all because Donna set her up for success. Since Hale was all primped and pretty, Donna and Lindsey brought her to the SSD holiday party. 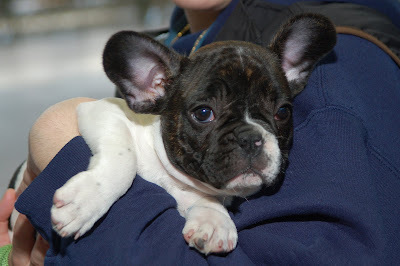 The other dogs and puppy raisers from the Northeast Puppy Raising Program also joined us. We had a lot of dogs at the party, but Hale did great! Donna and Lindsey took her through the line at the buffet table, but while she sniffed at the table a little bit, she didn't try to steal anything. Lindsey was even able to walk with her while holding two drinks in her hands! The same week as the holiday party, Hale took a scaled down version of the public access test as an evaluation. "She did pretty well," said Donna. "I was please with almost everything." 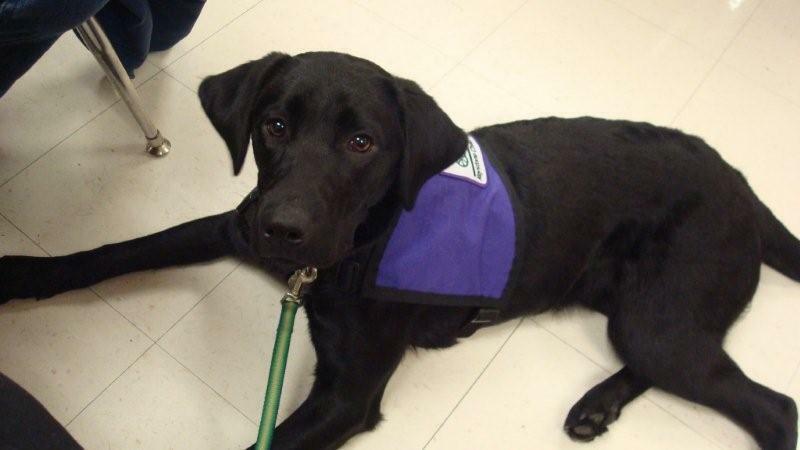 Evaluations like the public access test often help puppy raisers discover strengths and weaknesses, and Donna realized that she needed to work on "under" with Hale. Since the evaluation, they have taken every opportunity to practice "under." Hale will go under with a hand signal, although Donna has to guide her sometimes. Once Hale has a solid "under," Donna will introduce the verbal cue. In the Northeast puppy classes, Donna has been working on helping Hale differentiate between the cues "up" and "all the way up." "Up" means the dog puts two feet up on an object, while "all the way up" is exactly what it sounds like - the dog puts all four feet on an object. Depending on her mood, Hale might give an "up" or an "all the way up" for either cue. Susan, one of our other puppy raisers in the Northeast, suggested that Donna try working on "up" and "all the way up" at the same time. That would make it necessary for Hale to listen closely to the cues and not just do what she things she should do. Donna has been practicing both cues at home. Hale has also been making good progress with the cue "back." She walks backwards nicely as long as she has something like a wall or table to align herself with. She doesn't yet back up in a straight line if she's in an open area, but Donna believes that with a little more work, she'll have it. 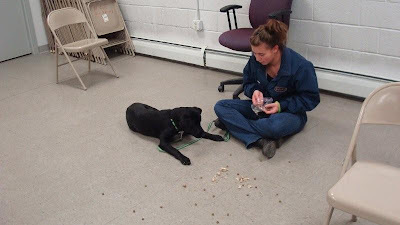 The Northeast group also likes to incorporate games into puppy class. 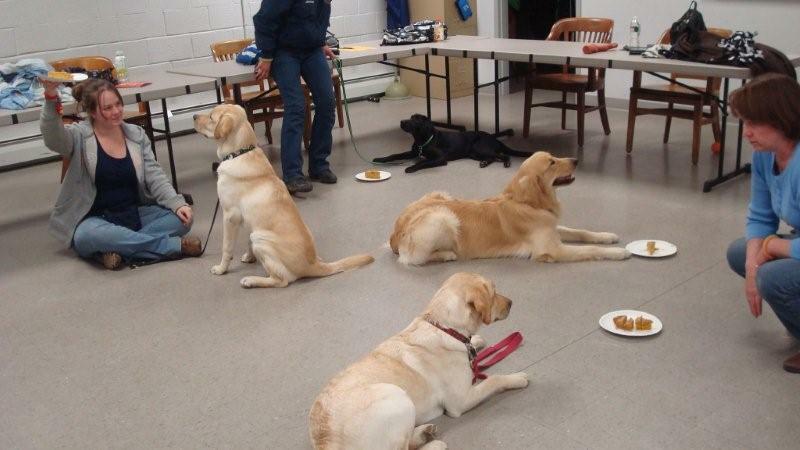 At one class, they played "Duck, Duck, Goose" with all of the dogs. Hale and all of the dogs did very well! It was an excellent way to practice their focus. The dogs enjoy the mental stimulation of the games. 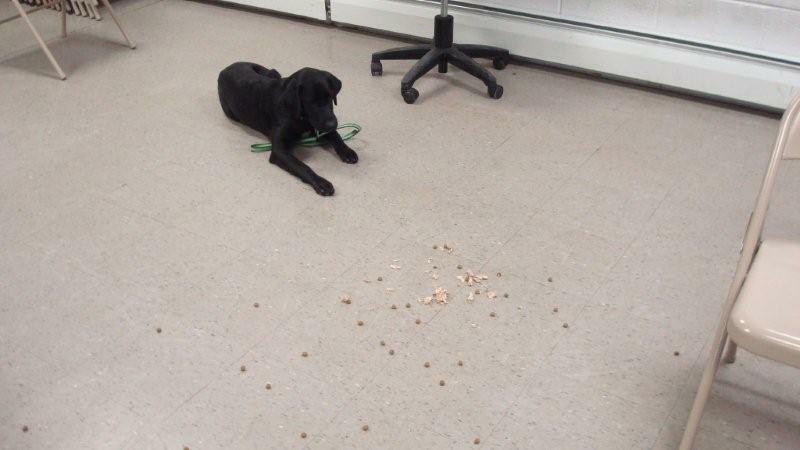 Hale and the other Northeast dogs in training also practiced "leave it." Look at their amazing self control! If you've been following Hale's progress here on the blog, you know that she gets very wiggly when she greets people. 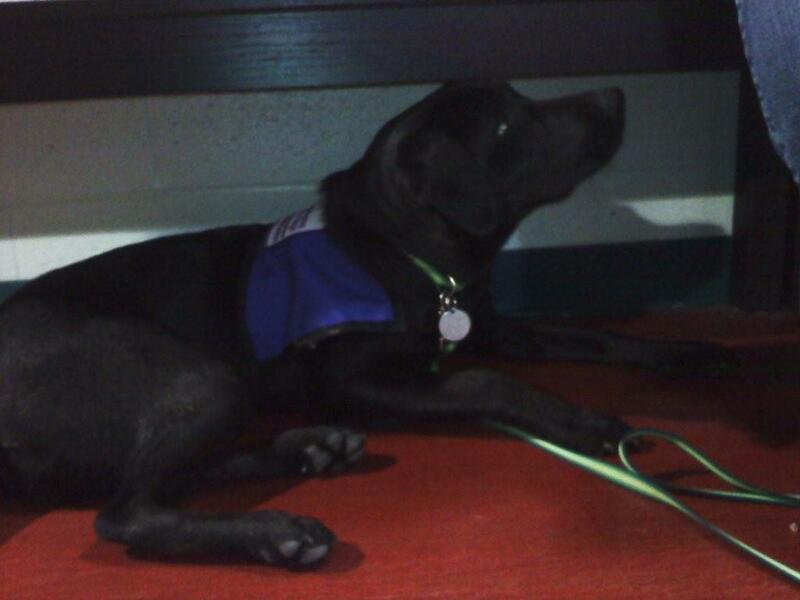 Donna has been working with other puppy raisers to teach her to stay calm when people are petting her. It's much easier to practice in a controlled setting with people who understand what you're trying to accomplish. Donna has decided that when strangers want to pet Hale, she needs to be in a "down." Once Hale is down, Donna lets people pet her, although she asks them to stop petting her if she stands up. This has been helping Hale learn to be calmer during greetings. Lindsey went to the DMV to renew her driving permit, and Hale got to go along. 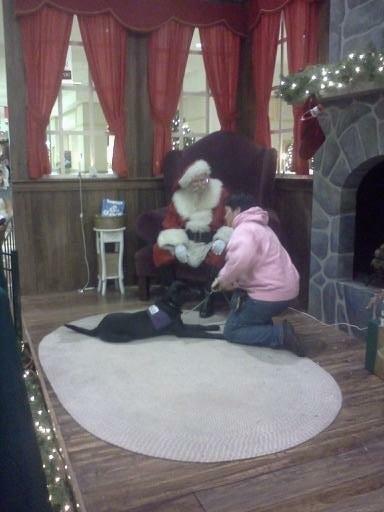 It was crowded, and really tested Hale's self control, but she did great! She also did a very nice "under" while Lindsey was filling out paperwork. Over the holidays, Hale went with her puppy raisers to pick out a tree. It was the perfect opportunity to practice "stay" and recalls! 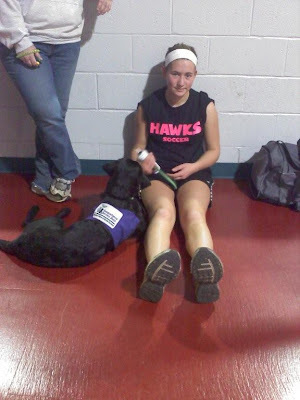 In December, Donna and Hale went to one of Lindsey's indoor soccer games. It could have been very stressful for a dog because the bleachers were very close to the field, and there was nothing separating them but a four-foot-high glass wall and a net above that. Hale did very well, though. 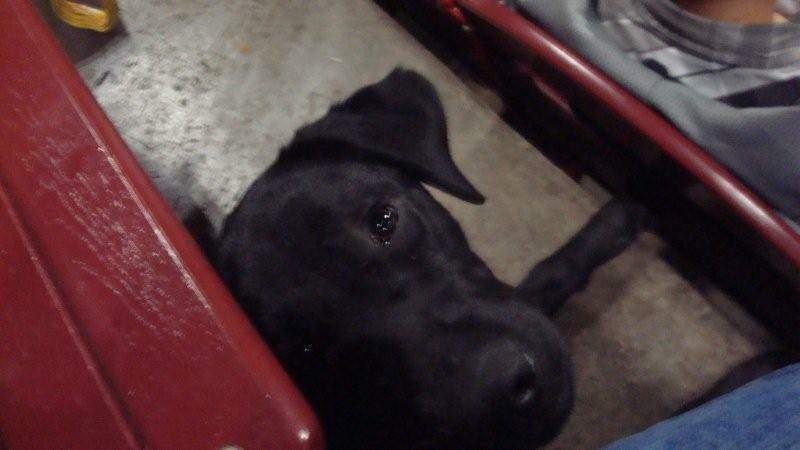 She stayed under Donna's bench for the entire game. She didn't even flinch when a ball hit the wall right in front of them! There was also a toddler with food and toys about 20 feet away from her, but Hale only watched her without trying to pop up out of her spot. Hale was able to be so successful at the soccer game because Donna planned ahead and set her up for success. "One thing I do before events that could be stressful is make sure Hale gets plenty of exercise," said Donna. "I really think that dogs (and humans) can handle things much better when they have the proper amounts of exercise. The day of the game, I got there early and walked Hale around the outside of the building for about 20 minutes. The exercise gave us both a chance to clear our heads." "December was a good month for Hale," said Donna. "I'm hoping that January will be even better."